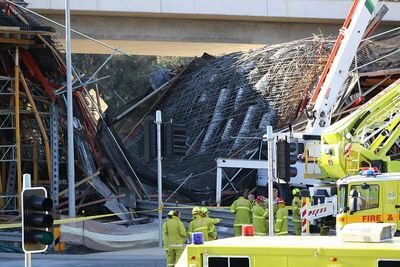 I asked – you wouldn’t be from Canberra would you? And yes – they were and yes they had largely given up on home gardening due to the number of possums in their neighbourhood. This post is dedicated to all the home gardeners in Canberra who are doing battle to protect their vegetables, flowers and herbs from the onslaught of possums that will – if allowed – eat their way rapidly through a crop that happens to suit their particular tastes. There seems to be no one menu for possums. They pick and choose – and once they do – whatever they set on is rapidly munched away. In memory of my mother’s garden, last year I set out to establish an array of geraniums. HA! Soon several were reduced to bare stalks. Those that survived were having to be covered at night. Not much fun in that. I have given up on any geranium collection. Meanwhile a friend, just a couple of streets away, her geraniums go completely untouched. As for vegetables – I use to grow tomatoes and strawberries – not anymore. As the tomatoes ripened, those that the birds did not sample – the possums chewed into overnight. Then there is the sad case of Italian Parsley. The same friend as mentioned above made the mistake of buying several pots of parsley and as it was raining – she left them out overnight for a good watering. In the morning she was confronted with pots of stalks. The possums did not even leave a note of thanks. 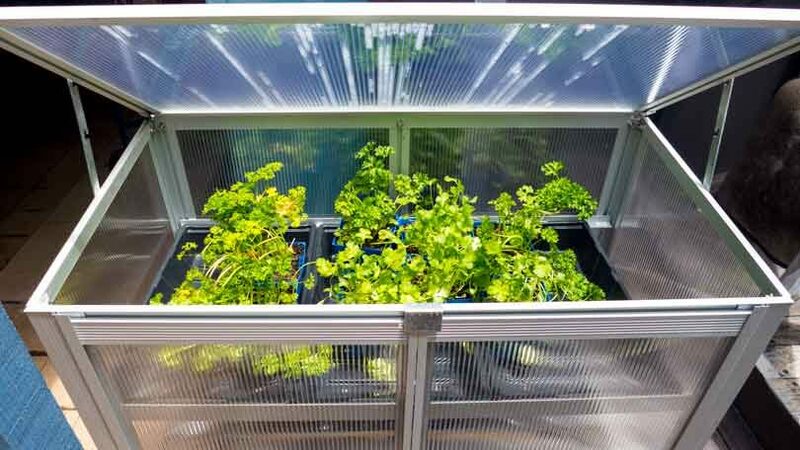 I have had similar experiences and now grow Italian Parsley under a set of cages. But even then as the parsley grows tall, any leaves that make it to the edges or the top do not last long. As for lettuce and other greens such as the wonderful English Spinach, I think the word goes out immediately that they arrived here in pots and all the neighbourhood possums then descend overnight for a feast. Yes, I did plant some once, it took two days and they were gone. 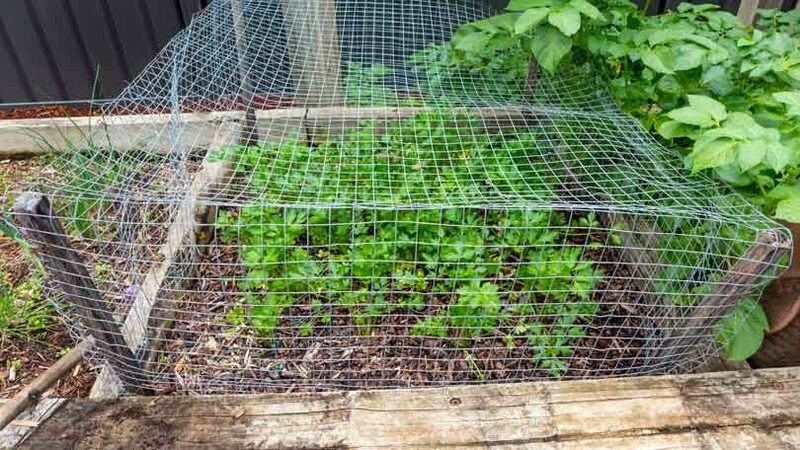 Given the possum plague in this neighbourhood, I have now cut back to a limited number of vegetables – and a number of cages. Last week I bought and put together a miniature glass-house to propagate special parsleys and some coriander (something the possums seem to crave after). Neighbours have commented on similar problems but we all think they descend on our house more than theirs as most have dogs and we do not. That may also explain why we have the pleasure of the occasional stampedes across the roof at night – ours being a place with no challenging canines to ward them off. We have seen a fox in this street, but maybe Reynard is not fast enough to catch the marauding possie of possums. The plague of possums does remind us of their presence in other ways. I now cover our verandah tables at night – in order to reduce the constant deposits of p@ss and cr#p left by possums having a night out on our tables. Then there was the case of a real estate agent talking at an auction across the street when he thought it had begun to rain. No such good fortune. He looked up and there was a possum in full daylight letting the unfortunate agent have a shower of urine. I am reminded of the Chief Minister’s household complaining in the press about how their vegetables and shrubbery was under attack from their own possum plague. I wonder if they ever solved that problem. My sympathies go out to others who choose to do the honourable thing by avoiding buying everything from the supermarkets and grow home veggies and maybe flowers. The bad news is that those creatures that pretend to be so friendly (and have so many allies) will be talking among themselves about their coming feasts as soon as your first plant enters the soil. We put in the efforts to have more greenery, to grow more at home and to have a fantastic ambience of an urban forest. Unfortunately, that has meant a proportional growth in the number of animals that live alongside us. The parrots and other birds I love and encourage. As for the plague of possums? I suggest no-one knows how to solve this question? I think I have heard all the suggestions possible. And I know this is not unique to my street, my suburb or to just Canberra. 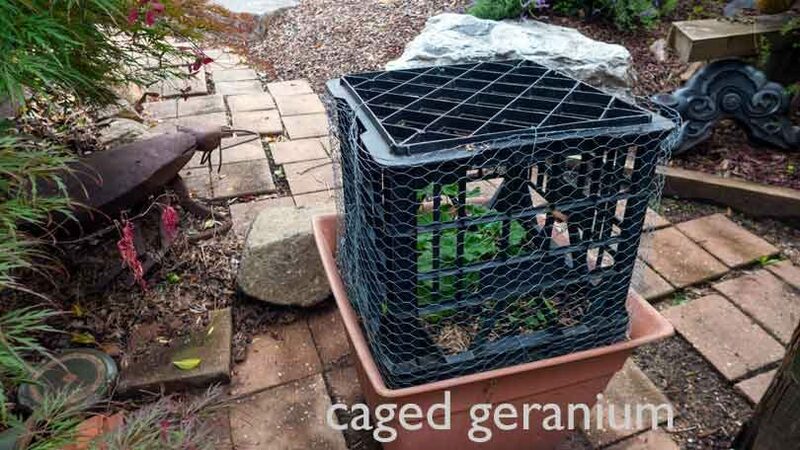 I have no idea how to solve this problem – I would really like to grow geraniums again and would like to extend the range of vegetables and herbs – and not have to put so much under a cage or nets at nighttime. Do you have any suggestions or tips on how to keep possums out of your garden? Let us know by commenting below. This is a classy and amusing bit of correspondence – I would like to join it from the perspective of a wildlife ecologist. Under natural conditions, the Brush-tailed Possum (BrTP) is sparsely distributed because food (bush tucker) and shelter (hollow trees, logs) are relatively scarce. Particularly when compared to urban habitat where both food (rubbish, well-watered gardens) and shelter (your garage, roof) are abundant. Conversely, predators such as the Powerful Owl (POWL), Spotted-tail Quoll (SPTQ), and the dingo were (relatively) abundant and provide a natural population control. Domestic dogs and foxes are inefficient and/or lazy predators. Government isn’t much help, justifiably due to costs (high) and priority (low). Big Final Solution: Re-establish Predators. The POWL requires large tree hollows for nesting. Hollows are now rare in cities but only a few are needed – the it has a large range and a big appetite. Artificial nest sites have been used in Melbourne (44gallon drum on a pole). Hunting perches attract raptors – circular perches is best -birds perch facing the wind (steering wheel on a pole works a treat; toilet seats are cheaper). It occurs uncommonly in the ACT but flight easy, rapid allows access to these resources. The SPTQ eats possums voraciously, and possible to a likely candidate for re-introduction. When a pine plantation near Bombala was being stripped at the sapling stage the SPTQ was re-introduced and the problem was solved. They are effective for rabbits too. The Mulligan’s Flat people have expertise here in re-introductions from their great work the Eastern Quoll (which eats small possums but not big ones). Flying foxes are as bad, if not worse, than possums. At night in summer they come in their droves. I doubt there were bats here until they discovered the introduced fruit trees, so in that sense they are not native here. But despite this still protected in their day roost by the lake. They should be got rid of. At times I think the solution is to net the whole garden permanently. At least the back garden. Wattlebirds destroyed much of my fruit crop this year. In particular my apricot tree. It started to flower in spring, but then the wattlebirds arrived and almost overnight the blossom turned brown from their efforts and the spring display never happened. My fruit crop was very much reduced. A netted yard is very tempting…but expensive. The fruit bats will look great hanging off the tram wires along Northbourne Avenue. Actually, they would be a good contender for the next ACT mammal emblem. I read somewhere that if fruit bats eat laxatives they are in trouble because their greatest fear is incontinence. Try few small dishes of ammonia, makes possums think there are cats somewhere in the yard. Yeah, I tried to get the possum plague up as an issue during the last election, but not one politician would touch it with a barge pole. 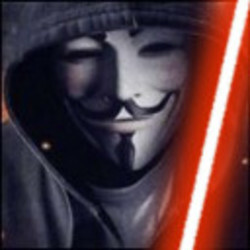 So, I accept I am on my own and have methodically set out to reduce the impact. I have had some level of success. A few initiatives include led sensor floodlights in the eaves (about $120 plus labour each), plastic owls and hawks around the yard, power lines taken underground ($2,300 to actew agl) liberal applications of dynamic lifter, horse and alpaca manure on garden beds, napthalene spread in all ceiling areas, an infra red sensor sprinkler system, all trees having a possum collar fitted, spikes fitted to the tops of fences and dried ghost chilli powder applied to high traffic areas. The furry critters still come, but the numbers are way down. I am now contemplating an electric fence. Of course, a cull would be helpful. Thanks Paul, great article! 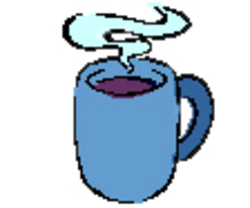 However, I do have some information that may help. 2. wherever I put cuttings of mint peppermint or perennial basil, they left the plants alone for a few days but then re-attacked the plant when the cuttings wilted. Same applied to tansy. BUT…. 3. wherever I put cuttings of wormwood (I used wormwood tree – absinthium aborescens) plants such as broccoli, spinach, chard, fennel, cos, etc. were not touched; even for a couple of weeks when the cuttings dried or became stale. Obviously fresh cuttings are better. But now I have healthy abundant crops of all of the above, and the possum still lives in the carport, which is where I put the dogbane to stop it from eating select succulents.